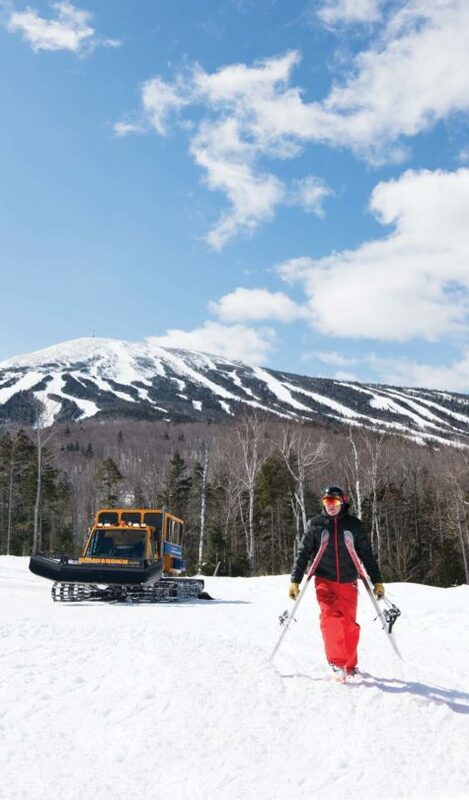 Sugarloaf introduced cat skiing at the resort in March 2018 to help backcountry skiers and snowboarders get up the mountain quicker via yellow snowcats. Backcountry skiing is patrolled, but the 100- acre backcountry skiing area is remote and is considered dangerous to ski alone. A Sugarloaf employee loads skis onto a snowcat. Walking up Sugarloaf's Burnt Mountain to go backcountry skiing takes a couple of hours, whereas the snowcat can reach the summit in only 20 minutes. Before weaving between trees and traversing ungroomed snow, backcountry skiers usually have to hike up a mountain. 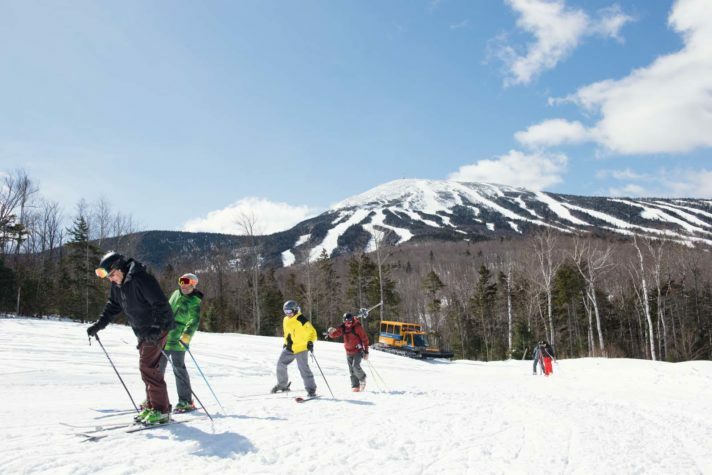 At Sugarloaf, it can take a couple of hours to reach Burnt Mountain’s summit before skiing down its snow-filled glades. With the introduction of cat skiing last year, that commute time has been cut to 20 minutes. Cat skiing means that skiers and snowboarders are taken up a mountain in a snowcat to reach ungroomed terrain. The large yellow vehicles have thickly treaded tracks designed to travel easily through heavy snow. 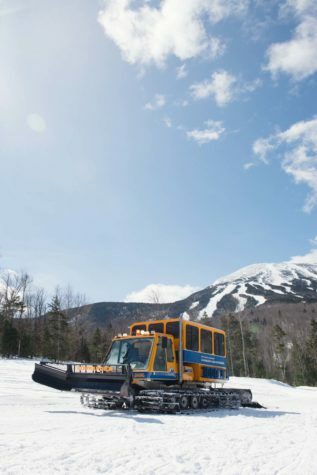 Although skiers and snowboarders have been skiing down Burnt Mountain since long before the resort began offering cat skiing last March—and even before the resort officially opened its side-country terrain in 2014—the two snowcats, which can carry up to 12 passengers every half-hour, make the experience more accessible. Burnt Mountain, Brackett Basin, and the rest of the side-country terrain located east of Sugarloaf Mountain have been hand-cut to clear underbrush and are patrolled, but there are no groomed trails and no man-made snow. “It’s kind of like an old-fashioned skiing experience,” says Ben Defroscia, Sugarloaf’s director of ski patrol. 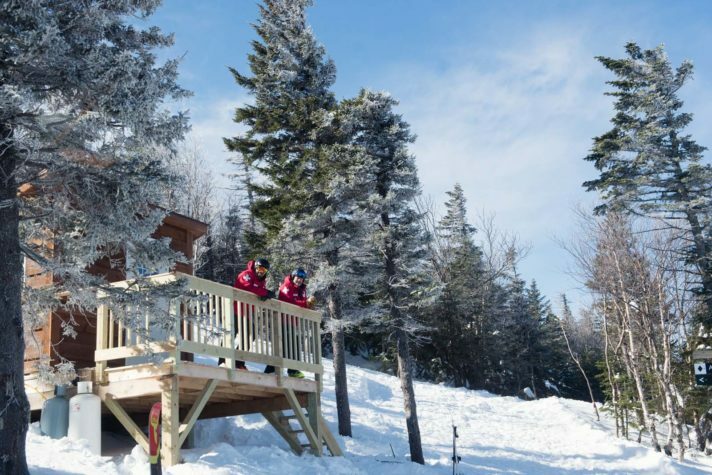 “You’re skiing whatever Mother Nature gives you.” Sugarloaf offers the only cat skiing operation in Maine and one of few east of the Rocky Mountains. The resort estimates cat skiing will be available this season beginning after the first of the year, once enough snowfall has accumulated. It will operate on Saturdays and Sundays from 9:30 a.m. to 2:45 p.m. Groups can also make private reservations for other days of the week. Backcountry and side-country skiing are strictly for experts who are confident in their ability to navigate the terrain. From boarding the cat to reaching the base of the mountain, expect the trip to take up to an hour and a half. Tickets for cat skiing must be bought in addition to day or season passes and range in price from $20 to $30. One of the most important things to bring is other people. Sugarloaf recommends skiing in groups of at least three because, even though the area is patrolled, it’s much more secluded than the resort’s groomed areas. 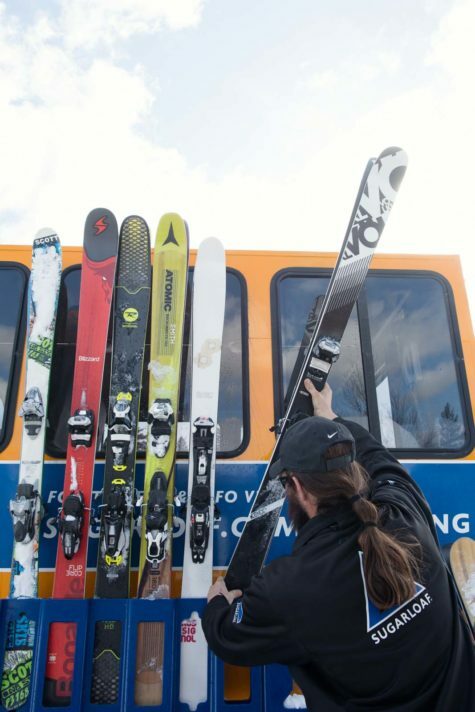 Skiers should also bring backpacks with snacks or lunch. Defroscia says people often stop partway down the mountain to eat and enjoy the view. Sugarloaf recommends packing a charged cell phone as well as extra layers, water, and a trail map. Take the Whiffletree chairlift, ski down Tohaul trail past the King Pine lift, and enter a marked trail. It takes about 15 minutes to ski from Whiffletree to the pickup location. At the summit of Burnt Mountain, skiers and snowboarders can choose between two glades to go down. The Androscoggin is accessible from the drop-off location and is the “friendliest” glade according to Defroscia, because it’s more open and has fewer trees. If skiers head to the right, they’ll find the Kennebec glade, which is steeper and more challenging. Partway down each glade, skiers can access Little Androscoggin or stay on their original glade. Little Androscoggin is more challenging than Androscoggin, but not as steep as Kennebec. Skiers and snowboarders could reach the base of the mountain in 10 to 15 minutes, but Defroscia says most people extend the experience and take an hour to come down. There are over 100 acres for skiers to explore on Burnt Mountain. Sugarloaf has two snowcats, which can each carry up to 12 skiers and snowboarders.